Influenza viruses of two subtypes, H1N1 and H3N2, have been causing respiratory infections in humans since 1977. Before that year, it was believed that only one human subtype circulated each flu season. How did this unusual situation come about? Major changes in the surface glycoproteins of influenza virus – called antigenic shift – lead to worldwide epidemics of influenza known as pandemics. There have been six instances of antigenic shift since 1889. In that year, H2N2 viruses circulated, followed by H3N8 in 1900, H1N1 in 1918, H2N2 in 1957, H3N2 in 1968, and H1N1 in 1977. Each pandemic strain carries HA and NA proteins that have been absent in humans for many years, and therefore immunity is either very low or nonexistent. Influenza viruses of the H3N2 subtype were still circulating in humans in May of 1977 when H1N1 viruses were isolated in China and then Russia. In the winter of 1977-78 the H1N1 viruses caused epidemic infection throughout the Northern Hemisphere. The results of serological tests indicated that the HA and NA glycoproteins of the 1977 H1N1 viruses were very similar to those from viruses of the same subtype which circulated in 1950. Palese’s group compared viral RNA of one 1977 isolate, A/USSR/90/77, with RNA from a virus isolated in 1950. To their surprise, the two viral RNAs were highly related. In contrast, there was less similarity between viral RNAs from the 1977 H1N1 virus and H1N1 viruses that circulated in humans between 1947 and 1956. …it is possible that the 1950 H1N1 influenza virus was truly frozen in nature or elsewhere and that such a strain was only recently introduced into man. The suggestion is clear: the virus was frozen in a laboratory freezer since 1950, and was released, either by intent or accident, in 1977. This possibility has been denied by Chinese and Russian scientists, but remains to this day the only scientifically plausible explanation. The close genetic identity between the 1950 and 1977 H1N1 strains was revealed by oligonucleotide mapping. In this technique, purified viral RNA is cleaved with an enzyme, RNAse T1, that cuts the RNA after every G base. The oligonucleotides are labeled at the 5′-end with 32P, separated by two-dimensional gel electrophoresis, and detected by exposing the gel to X-ray film. 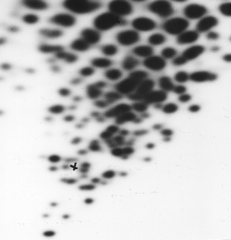 The oligonucleotides form a pattern (‘fingerprint’, pictured) that can reveal genetic differences between virus isolates. This technique is more sensitive than serologic assays, but only provides information on about 10-15% of the viral RNA. However, the larger oligonucleotides are a representative sample of the entire genome. The authors calculated that there was a minimum of 8 bases changes among the large oligonucleotides of the RNAs of the 1950 and 1977 H1N1 viruses. In contrast, the RNA of the 1977 H1N1 isolate had 38 base changes compared with a 1947 H1N1 isolate. Oligonucleotide mapping was used to study the genome of the 1977 H1N1 viruses because nucleotide sequencing was not yet in widespread use. Because nucleotide sequencing is now routine, oligonucleotide mapping is no longer used – as scientists like to say, it has been relegated to the museum of obsolete experimental methods. I was a Ph.D. student in Peter Palese’s laboratory when Katsuhisa Nakajima and Ulrich Desselberger did the work in 1978 that revealed the close identity of the H1N1 strains with isolates from 1950. It revealed to me, for the first time, how an important finding creates enormous excitement in the laboratory and in the scientific community, and how general interest is fueled by the press. The work was accompanied by a News and Views article entitled “Influenza A viruses: shaking out our shibboleths”. I clearly remember Peter Palese asking me if I knew what a shibboleth was. I thought it was one of H.P. Lovecraft’s fictitious creatures. You stated there was an antigenic shift in 1977. How can you be so sure there was a shift in 1977 when the RNA is so similar to that of a 1950 strain? Wow what a difference a year or two makes! These guys’ theories look as insane as they actually were at the time. It is just like those Xians who predict the end of the world in a coming year; then you get to gloat when their silliness did not pan out. LOL!! The anti-vaccine crowd are the truest of true religious believers. I am a researcher ” You mean you Google scary theories and random bits of science that strikes your fancy all day? Wow, i clicked “like” because you embody the wildest most dramatic* [this is key] post yet. Virology is too boring for you? Then you have the wrong type of imagination for any meaningful science comprehension. Virology can be amazing if you just open your heart to wonder! I clicked “like” for this one too. So, dramatic! Actually, from what I know H1N1 Originated from the states from the production of livestock (In particular, pigs). What had happened was you had all these pigs being pumped with steroids to stunt growth, and considering they were all cloned, when they got sick, all of them got sick. So the effect was a crap load of extremely sick and dying pigs. Now Producers decided to start treating the pigs with antibiotics, eventually the pigs became immune to the antibiotics and hence, a new super virus was created and uncontrollable for a while. November 1977, I had H1N1. I was 6 years old. I remember 106.2 fever being mentioned by physician to my mother as well as my left lung had fluid in lower lobe. I just remember bad chills, burning eyes and being sick for a long time. I missed a lot of school. I was sick enough that I remember that flu like it happened to me yesterday. I will never forget how sick I felt. In any event, I see the same practice but different physician. November 2010, I discussed that illness with my physician, reviewed my records from 1977. Knowing what it’s like having the flu, I feared becoming ill from vaccination. I just thought it was odd that the seriousness the media and health organizations advise us on influenza, that I never became sick with influenza since 1977. I also told him that over time, I’ve been exposed to people who had an influenza strain (depending on timeframe) but never became ill as well. He told that because I became ill to H1N1 in 1977, I have immunity to most, if not all, identified influenza strains. At least something positive came out of that.